The 1890s were a thrilling time in the history of the American West — the western states were raw, wild, and cutthroat. In that environment, Walter Devereux decided that the small mining town of Defiance, as Glenwood Springs was originally known, needed a taste of European style. Construction began in 1891 at a cost of $850,000 — over $23 million in today’s dollars. The architect, Edward Tilton, designed the building as a replica of the Villa de Medici in Rome, but despite its Italian stylings, the hotel is built from local materials like Roman brickwork and Peach Blow sandstone. In June of 1893, the hotel opened to a spectacular show, complete with a fireworks display, an orchestra in the main ballroom, and dining at midnight for the 300 couples that attended. Devereux spared no expense in the creation of the hotel. Where the courtyard is now, the south court boasted a large pool from which an electrically-lit fountain shot water almost 200 feet in the air, sparkling in the sunlight. And in the existing lounge, a 25-foot waterfall fell from the rear wall into a pool beneath. In 1905, Hotel Colorado became the temporary home of President Theodore Roosevelt and his aides on a three-week hunting expedition. Roosevelt was already a fan of Colorado’s Western Slope, having visited the hotel on several occasions. It’s even said that the world’s most famous toy, the teddy bear, traces its origins to Hotel Colorado. Legend has it that Roosevelt was feeling down after an unsuccessful hunting trip, so the staff at the hotel made him a stuffed bear out of scraps of material they had around. Roosevelt gave it to his daughter Alyce, who named it Teddy after her father’s nickname, and the Teddy Bear was born. Prohibition wasn’t federal law until 1920, but Colorado enacted it early, in 1916. As we all know now, people still want alcohol whether it’s legal or not, and the little mountain town of Glenwood Springs wasn’t immune to the black market that sprang up. The saloons and gambling halls on Seventh Street basically closed down as a result of Prohibition, so speakeasies started to emerge in their place. Jack Verain, who later went by the name Diamond Jack Alterie, was effectively the local kingpin at the time. He provided a place for people to get a drink and play cards away from the eyes of the law, and Hotel Colorado was his headquarters. He entertained fellow mobsters here, including the infamous Al Capone, and had a special front door installed so that he and his unsavory ilk could come and go as they pleased, unnoticed by guests or police. In its 125 years of history, Hotel Colorado has been home to a wide array of famous guests and auspicious circumstances. The “Unsinkable” Molly Brown, best remembered for encouraging the crew in Lifeboat No. 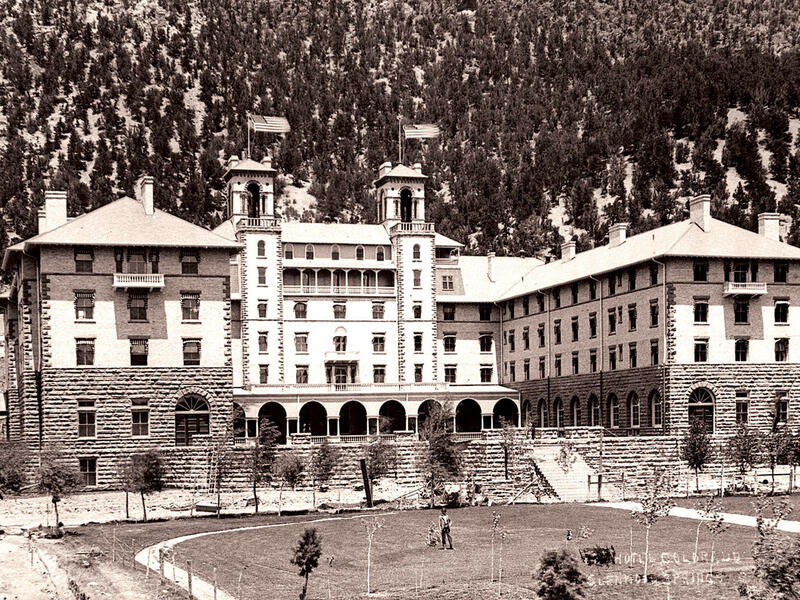 6 to return to the debris field of the sinking Titanic to look for survivors, visited the Hotel Colorado to enjoy a mountain vacation on multiple occasions. Today, one of the hotel’s Tower Suites has been turned into a tribute to this remarkable woman. Today, Hotel Colorado embraces its history. The hotel still retains its blend of Victorian and Italian styling, and signature suites dedicated to Walter Devereux, Teddy Roosevelt, and Molly Brown display the hotel’s rich past. You can tour the same courtyards and soak in the same pools as some of our most famous public figures, stay in their rooms, and witness the same sights and scenic views that they did — but with a modern twist! After all, Teddy Roosevelt didn’t have access to air conditioning or wi-fi. Book your trip today!